Food wastage is a massive issue. We waste 6 billion a year in Australia alone, never mind countries far larger than us! The world has plenty to eat, if we just stopped throwing away perfectly fresh food. It’s infuriating to me sometimes, just how simple the solution is! I wrote another little post about food wastage and the ‘shame list’ we’ve implemented at home here if you fancy reading. For this post, I’ve decided to set a mission. Let’s look at a few things that often end up in the bin, and see what we can do with them to make a little difference to the planet and to our nourishment in a couple of cases too! I have a crazy goal that we can get to 100 things to do with scraps. Care to help by adding your own ideas in the comments? 1. Egg shells, veggie scraps, unbleached tea bags. All perfect to pop in your green waste recycling, or to make your own compost for yours or a friend’s garden. 2. Cheese rinds from parmesan, gruyère, gran padano etc… SOUP. The perfect flavourful soup enhancer. Pop them in & pull out before serving. 3. Broccoli or kale stalks. Chop fine and fry in butter, with herbs and celtic sea salt – a fab veggie side for meats and fish, or you could do as my 3 year old does, and eat raw! He’s a minority though, I’m fully prepared to admit! 4. Spinach stalks. Freeze them and use in future casseroles or bakes. The bitterness subsides with cooking. 6. Bread Ends. Those crusts at either side of a loaf. Do you keep them or toss them? Keep them over time in the freezer and when you’ve got enough, pop them in a very low over for an hour or two until they dry out. Blitz them, bag them and use them for crumbing. Pop what’s left in a jar and store in the freezer to avoid pantry moths. 7. Egg shells. Pop them in your compost or green bin. Or you can crush egg shells and sprinkle a border around your veggie patch. Apparently snails and slugs won’t cross this border and your lettuces will remain your property! The mum in law has confirmed this rumour, who’s a veggie garden enthusiast. 8. Bones. Had a roast chook? Lamb shoulder? T Bone or farmer’s cutlet? Ribs? Do not, I repeat do not throw away the bones – even if you’ve eaten from them. Pop said bones, rinsed, into a pot with some filtered water and stock veggies and leave overnight in a 120 celsius oven. Next morning you have a flavoursome, mineral rich power house to add to soups and sauces (reduce a cup for 20 minutes with a teaspoon of butter at the end, to make a delicious glaze). You can even drink by the cupful with a few drops of tamari or celtic sea salt. Divine. Ridiculously gentle and nourishing and if on the mend from chronic fatigue, gut issues or autoimmune disease, it’s honestly the best thing you can consume! 9. The water you’ve steamed veggies on top of / cooked veggies in. Cool it & drink it. Or add it to soups instead of plain water. Full of vitamins! 10. The spent fibres from veggie juicing. Make a quick stock out of it with some parsley, onion and thyme. Takes 30 seconds to whack in a pan. Leave on low for an hour. and strain, jar + freeze. 11. Bruised / over ripe fruit – Compote time! Pop in a pan with a few drops of stevia or a little drizzle of rice syrup, maple or honey and simmer with a pinch of your favourite sweet spice for 20 minutes. Serve warm over ice cream or yoghurt. Delicious! If you have a large amount of food going to waste from a big wedding or corporate event, know your local food rescue program. Mine is OzHarvest and they’re the best, feeding millions of homeless people with perfectly good leftovers! http://www.ted.com/talks/tristram_stuart_the_global_food_waste_scandal.html… Great Ted Talk on global food wastage. Presented in a light yet impacting way. Real Food. Less Waste. Happy Planet. Being the sugar nazi that I am, I am so going to try this, but with rice or coconut syrups – confiture de lait is a delicious memory from childhood too! I shop with a list so have much less food wastage than I used to. Any scraps go to the chooks which they are ecstatic about and comes back in lovely fresh eggs. Summer is here, some fruit left over that nobody wants to eat, or bruised, throw them in a blender with ice and sugar ( or natural sweet I don’t remember the name), it makes a beautiful granita. Coconut : drink the water, eat the flesh, yum … And use the fibres out the shell as a body scrumb… I am quite sure you can use the whole coconut to make a beautiful homemade body nourishment product, which will smell delicious too. – Hang onto bacon rinds. Better than salt for flavouring soups and bolognaise sauce – and perfect dog treats! – Tomatoes that have gone soft – whack them in the slow cooker with herbs, garlic and onion on low all day – and freeze for pasta sauce. – Used coffee grinds can also fertilise garden – they keep snails and cats away, too. Yay. Thanks for kicking things off Emma 🙂 I have this crazy idea that we can take it to 100 things to do with scraps!! Citrus fruits peels : Christmas is around the corner, make a beautiful treat. Cut them in stripe, throw them in boiling water + a little bit of sugar ( I know Alexx 😛 ) + star anis,few cloves and few grains of blacks pepper, wait for the boil then wait 2 more minutes, take the peels out of the water ( leave the water on the stove) , rinse the peels in cold water, put them back in the sauce pan ans repeat twice, add more sugar, not too much, and leave it simmering for 30 to 60 minutes, then fill sterilised jars with the candied peels and cover with the syrup, and keep them in the fridge. Before using them, drain the quantity you want for 1 h, and then dip them in melted dark chocolate, put them on baking paper to cool down…you can do this step around Christmas and then have a beautiful treat. The original recipe is with orange peel but I must say I love to do it with pink grapefruit. Over ripe stone fruits ( cherries,plums,apricots) , make a tart or even a clafoutis ( faster and delicious. Coffee grinds can also be dried out and used to keep fleas off dogs. You can use stale oats and used by tomato paste to create a blackhead, skin smoothing face mask. Just combine together with a teaspoon of honey. Naturally fermented cabbage (so on the turn) is great for kim-chee and saukraut. I always make stock with veggie scraps, but tend to have more of them than I need. Now the extras go into a container filled along with egg shells with water and covered with a lid. Let it sit for a couple of days, strain and use the water on the garden, it’s full of nutrients. Even better use the water that you’ve boiled veggies or eggs in for even more nutrients. The scraps then go into the compost or worm farm, because they’ve been soaked for a while they break down even quicker. Add citrus peel to a jar of vinegar, let it sit for a few weeks then strain, add to a spray bottle diluted with 50% water and use as a cleaner for pretty much everything. Refrigerator soup, go through the the crisper at the end of the week before doing the next lot of shopping to find all the bits of left over vegetables, cut them up add the to the slow cooker with some dried and soaked beans, a tin of tomato, some bacon etc and turn the whole lot into soup. Leftover veges are always a treat in a frittata the next day. Also, we have used scraps of veges, rice and bones to make a casserole dish for our dog. He’s quite fond of this! 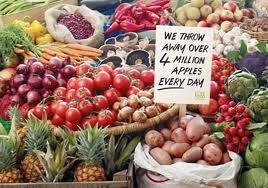 Food waste… it’s the lowest lying fruit of all! When you eat an orange, don’t throw away all the white layers under the peeling. Those contain powerful anti-cancer nutrients so eat them too! Great piece Alex, always freeze my over ripe bananas pull them out of the freezer & peel with a knife make great ice blocks. Strawberries freeze well too. With the current glut buy them cheap cut of leaves and cut into slices. Freeze in potion size bags. Great over vanilla ice cream. Other scraps into soups, casseroles & compost. Food is too valuable to waste. I always seem to have either egg yolks or egg whites in the fridge! Egg yolks are great hair conditioners – make sure you rinse in cold water though! Egg white makes a great facial mask. Either make a nice treat for the doggy. fab rebecca. Thx for contributing! 53 we’re at now… yay. Chop the off cuts of citrus fruits (I used to waste half lemons and limes a lot thinking I would used them and them forgetting about them.!) in to small wedges. Squeeze them in to ice cube trays then pop them in, top the sections and top up with water and freeze. Great in a G & T or non alco for kids. I typically don’t need to use a whole tin of coconut milk / coconut cream I just use it up oyt of habit, these again can be frozen in ice cube trays for a quick non dairy sorbet or added to a curry at the end. I freeze ricotta so that it doesn’t get wasted, it just needs draining well before use after defrosting. I make a quiche most weeks with left over odds and ends of veg some ricotta out the freezer. I make a caramelised garlic paste with cloves that are getting a little old, by boiling them and adding balsamic vinegar, sugar and salt they don’t taste old any more! I use my old chillies to make chilli salt, when they are old and shrivelled you can put them in the oven to further dry out on a low heat for an hour or so then blitz with 100g good sea salt. You can add a few olives or citrus peel or garlic with the drying chillies to give the salt a twist. Best of luck, I have not doubt 100 will be surpassed very soon! Emma! With responses like that, I’d say you’re right. Thx for adding your wisdom. It’s all in the power of the collective! I love this post. My son is a hopeless eater. I would love if someone had an idea for what I should do with half eaten weetbix and toast etc. I hate throwing it away – but was putting on weight from eating his leftovers! Help! This may not be your typical ‘scraps’ suggestion, but…. I made wild plum jam from fruit I harvested on my property. Unwilling to throw away the pulpy pits, I instead have them infusing in organic vodka, with a bit of damiana liqueur, peppercorns and honey. I’d say it has about three weeks to go, before I strain it and bottle it up for the holidays! Love it. Nothing erong with a little home made tipple! Great list! I would love to see this revised when you’re done & sort into categories. That way I could print off & refer to when I’m cooking. Dodgy avos can be used to nourish hair or skin. Potato peelings can be coated with some olive oil & sea salt then baked til crisp. Leftover lemon skins can be added to your vinegar spray. Herbs can be chopped up, placed in an ice cube tray, fill with olive oil & freeze. Dregs of peanut butter can be smeared onto dog toys & hidden around the backyard to keep pooch occupied. Leftover pan juice to make gravy. Leftover juices from a roast, I keep, refrigerate & use the fat to cook other meat in! Leftover thick porridge can be made into little “pancakes”, fry off in a little coconut oil or good grass fed butter if you do dairy. Pulp from juicing is awesome made into crackers and baked at low temp in the oven or dehydrated. I think well-cleaned egg shells can be dried and powdered as used as a source of calcium or better still added to lemon juice or apple cider vinegar to make a dietary source of calcium citrate? I use coffee grinds to make a body/facial scrub. Just fill a jar with the grinds and add olive or coconut oil and your choice of essential oil… can be messy to use but your skin feels better for it .